Simple Google Calendar Integration. No Back and Forth. If you are a frequent Google Calendar user, you know how important it is for appointments to show up on there religiously. TimeTap takes care of keeping your appointment calendar and your personal/work calendars all lined up. Just grant TimeTap permission to sync with your preferred Google Calendar account and we'll take care of the rest. When clients book with you on TimeTap, that appointment will send right up to Google and vice versa so you never have to worry about missing a beat! Any times you add to your Google Calendar as 'Busy' will automatically block you off in TimeTap so you'll never be booked when you've got vacation planned or a doctor's appointment booked. You've got a lot to keep up with and that includes keeping track of multiple calendars for personal, business, and community events. TimeTap makes it easy to sync with any calendar you depend on. 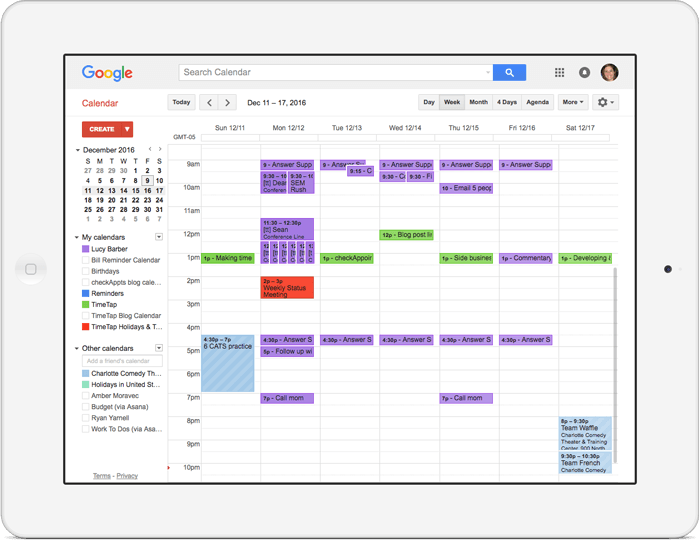 Get your Google Calendar and Appointment Scheduler in Sync!